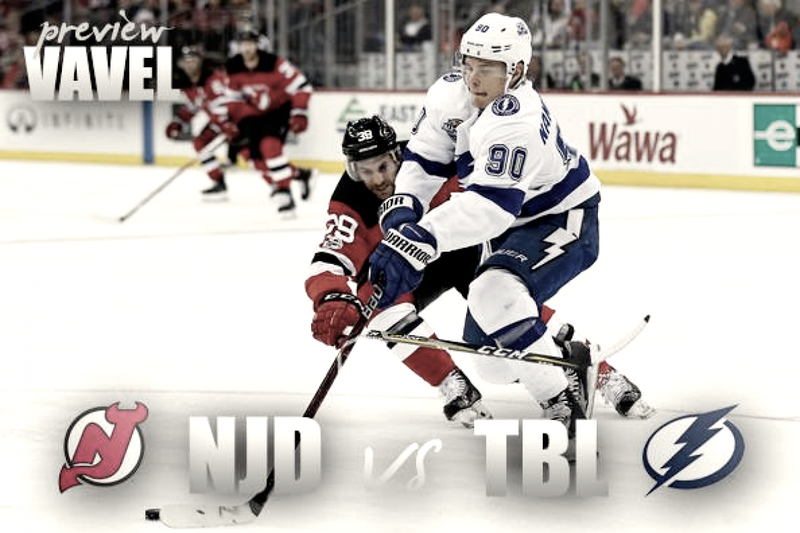 The New Jersey Devils face the number one seeded Tampa Bay Lightning to kick off the second day of the opening round of the 2018 NHL playoffs starting on Thursday, April 12th. This will be an interesting series to watch because during all three match-ups this season, New Jersey had Tampa's number. The Devils swept the season series 3-0 against Tampa with one of those coming in overtime. New Jersey may be able to make some noise in the playoffs if they can keep figuring out this difficult Tampa squad. They faced off for the first time on October 17, 2017, when the Devils barely hung on for the win. Tampa controlled all of the 5-on-5 play, but thanks to the goaltending of Cory Schneider, who faced 37 shots and 73 attempts against him with a penalty kill in the 3-on-3 OT, they got the 5-4 win in a shootout. This gave New Jersey the 1-0 season lead. The next two match-ups on February 17, 2018, and March 24th weren't much different. New Jersey was outshot 51-28 on the 17th, but still got the 4-3 win thanks to goaltending again. The Bolts heavily dominated 5-on-5 play again and drew a fair number of penalties on New Jersey, but in the end, they still lost. The last match-up came on March 24th in the heat of the playoff race where New Jersey was looking to stay alive. New Jersey once again found their answer on the back of their goalie, Keith Kinkaid. The Devils were outshot again but kept it close this time by getting 31 shots on net while Tampa got 36 on net. New Jersey wrapped up this series with a 2-1 win and took the season series 3-0 over Tampa. The obvious first player to watch for the Devils is Taylor Hall who led the team with a whopping 93 points which is 41 points higher than the next Devils player. Hall had a 43 point improvement over last year which was his career best. Besides points though, Hall put up career numbers in goals, assists, plus/minus, and he is a strong candidate for MVP. The first overall pick in last year's entry draft, Nico Hischier, can play. Second on the team in points with 52, he's third in assists and goals. Hischier has shown that he can be a reliable rookie. He played all 82 games for the Devils and while being a presence on offense, he can be a presence on defense as well. Tampa has to watch out for him, or it may cost them. While Tampa relies on one man, New Jersey splits their goalie time. For the Devils to be successful, it all comes down to goalie play. Kinkaid will most likely get the start for New Jersey, and if he can retain his streak then New Jersey may make some noise. If Schneider and Kinkaid become truly reliable options in this series then Tampa may not have the tools to take down the two-headed beast. Now to look at the Tampa Bay Lightning match-ups. This guy is good... scary good. Tampa has a three-headed monster on offense that the Devils will attempt to strike down with their trident and it all begins with the man in the video above, Nikita Kucherov. He leads the team in points with 100, with the next closest being 14 away goals with 39 and assists with 61. "Kuch" has fast hands, is a quick skater, and is an offensive juggernaut. New Jersey will have to slow him down by any means necessary if they even want the slightest of chances in this series. Some people may have the next person to watch be Steven Stamkos, but I am going to go outside of the box and choose Tampa's number one defender, Victor Hedman. Hedman is fifth on the team in points with 63 and third in assists with 46. Hedman is the quarterback on the powerplay and is a punishing, shutdown defender. New Jersey has to find a way to be able to create an offense around him or they are going to have a tough, physical series that they can't match. Hedman brings a strong physicality to the ice on every shift, and if New Jersey can't match it, then it's going to be a long... short series. The last player match-up I have for you is, of course, Vezina Trophy candidate, Andrei Vasilevskiy. Vasilevskiy is one of the best goaltenders in the NHL right now and the video above is a pure example of why. He has the ability to take over games, keep Tampa in them, and make ridiculous, jaw-dropping saves like the one above while doing it. But, it has been shown that he can be rattled. If New Jersey wants to win, they have to get the puck on the net and score quickly and in bunches. The Devils have to get to him early and get him off his game to even have a chance or this is going to be a quick series. For New Jersey to win they must figure out how to stop the best team in the NHL from walking all over them. New Jersey finished the year in the second wildcard spot with a 44-29-9 record good for 97 points which was 15 points behind the number one seeded Lightning. New Jersey had the tenth best powerplay achieving a 21.4% success rate. They were tied for the seventh penalty kill as well finding an 81.8% success rate at killing off penalties. The Tampa Bay Lightning finished atop the Eastern Conference attaining the number one seed with a 54-23-5 record good for 113 points. They averaged 3.54 goals for per game which was the best in the NHL and have the 13th best goals against per game with a 2.85. New Jersey has to find a way to slow Tampa's goal scorers and exploit how many goals they give up if they want a chance. They had the third best powerplay percentage converting 23.9% of the time, but they only killed off 76.1% of penalties to give them the 27th spot. New Jersey needs to convert their chances on the powerplay and exploit this weak penalty kill to be able to do anything in this series. As much as I want the upset with how great of a season the New Jersey Devils are having, I'm gonna have to give it to Tampa. I don't think that New Jersey has the necessary pieces in place to stop all of the weapons that the Lightning have in place. I mean teams could barely stop Kucherov this year and when they could someone just stepped into his absence and scored the clutch goal. Vasilevskiy looks unbreakable at times, and unless they find Mr. Glass in time to exploit his weaknesses, I don't think New Jersey has enough firepower to make him crumble. For as great as Hall and Hischier were this year, Stamkos and Kucherov were ten times better. If it comes down to a goalie match-up, I have next to zero faith that either Kinkaid or Schneider have what it takes to put the team on their backs and carry the series. In the all the match-ups this season, New Jersey got severely outshot and that was no coincidence. I would be shocked if this series went six, so I'm taking Tampa in five. Sorry Devils fans, but you got a raw deal here to start the playoffs. What do you think of the series? Who do you think will win? Let me know in the comments below.